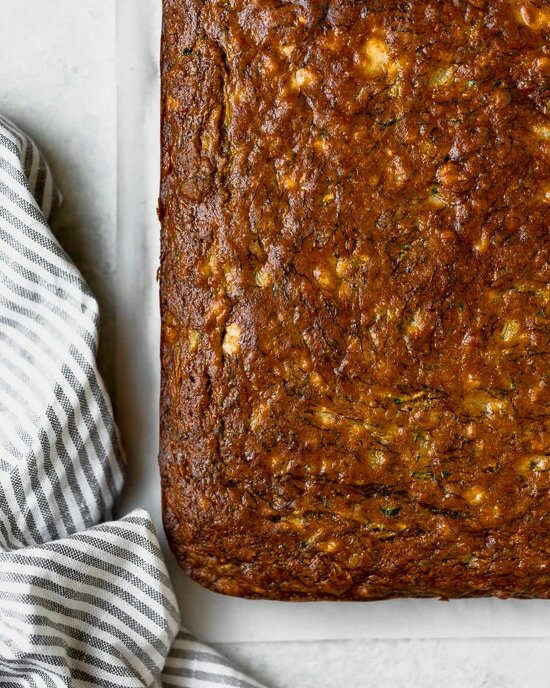 Fruity, moist and delicious, this banana and zucchini cake is loaded crushed pineapple and lightly sweetened with honey. 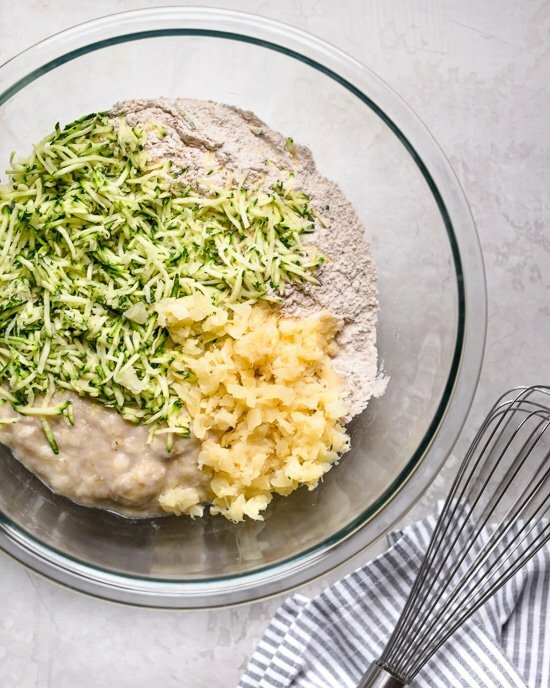 It’s zucchini season which makes me super excited to make bread and muffins with zucchini! A favorite is this Chocolate Chip Zucchini Bread which my daughter loves. 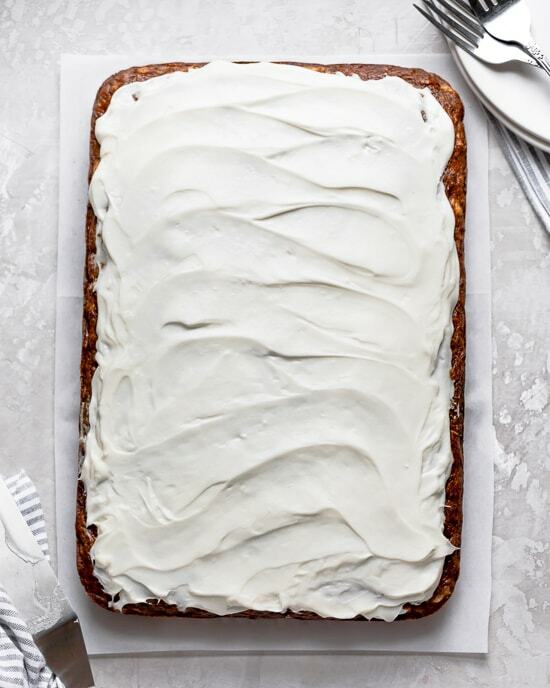 But for dessert, I loved how moist and delicious this easy sheet cake turned out lightly sweetened with honey thanks to the natural sweetness of the pineapples and ripe bananas. 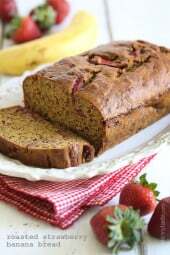 I tested this with a blend of whole wheat and white flour as well as gluten-free with Bobs Red Mill Gluten Free 1 to 1 Mix and it turned out delicious both ways. If you wish to keep it dairy free, simply omit the frosting, it will still be delicious! To prepare frosting, beat together cream cheese, powdered sugar and vanilla until smooth. Refrigerate until ready to use. Preheat oven to 350°F. Spray bottom of 13x9x2-inch nonstick metal pan with cooking spray. In a large bowl, combine flour, baking soda, salt, and spices; stir well with a whisk. In a medium bowl, combine honey, oil, eggs, and vanilla; stir well. Add zucchini, banana and pineapple; mix well. Fold wet ingredients with the dry ingredients and mix well with a spatula until combined. Spoon batter into the sheet pan. Bake at 350F for about 45 minutes, or until a wooden toothpick inserted in the center comes out clean. Spread frosting over the cake once cooled and cut into 16 pieces. So we would just use 1&1/2 cups of gluten free flour instead or do we need to use 3/4 cup gf and 3/4 cup something else? Thanks! 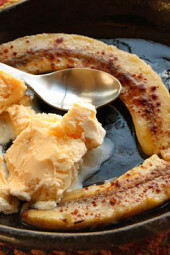 Can I replace the banana with something else? Hi, could this receipe be made in a loaf pan? Hi would I be able to make this in a bread pan instead? This turned out beautifully. Moist and delicious with or without the frosting. Love that there’s no added sugar. Make it, you won’t bedisappointed. Our celiac family loved this cake made with Bob’s 1 to 1 GF flour. For ease and time I mixed all the dry ingredients in my food processor and poured into a bowl. Next, I, shredded the zucchini removed to a towel , rolled, then twisted to remove excess moisture. And let it sit while added the banana and pulsed to make a fairly smooth consistency. Then all the wet ingredients were added until blended and finally added the zucchini with a few pluses to chop it up a bit more. Add the wet ingredient to the dry and continue per recipe. I must admit, I added more powdered sugar to the frosting, although it probably wasn’t necessary..
Can this be baked in a glass dish 13 x 9? I don’t own a metal baking pan that size. Gina, could you please explain something in the nutritional section. Some times it says 4 SP + 5 calories ….or 3 SP + 3. I not sure how to interpret this. LOVE your recipes! So good. I brought some of the cake into work. Coworkers liked it. I used all white whole wheat flour. The cake tastes better the 2nd and 3rd day. The cake came out great! It was moist and delicious. The frosting was a little sparse, in other words, not quite enough to put a good layer over the cake, but good flavor contrast with the sweetness of the cake. My cake was too wet. I am wondering if I added too much zucchini. I drained the pineapple and squeeze the water out of the zucchini. Sounds like it, did you use the same amount? Same thing happened to me. I don’t know what I did wrong. Made this tonight. Without frosting. It’s the first time ever when I’m doing a cake with zucchini, but I’m sure it’s not the last. This cake it’s amazing. Everyone in my family love it. Last weekend was http://skinnytaste.wpengine.com/yogurt-chocolate-chip-muffins/, a hit too. Thank you very much for your recipes. Made as written and this was delicious! 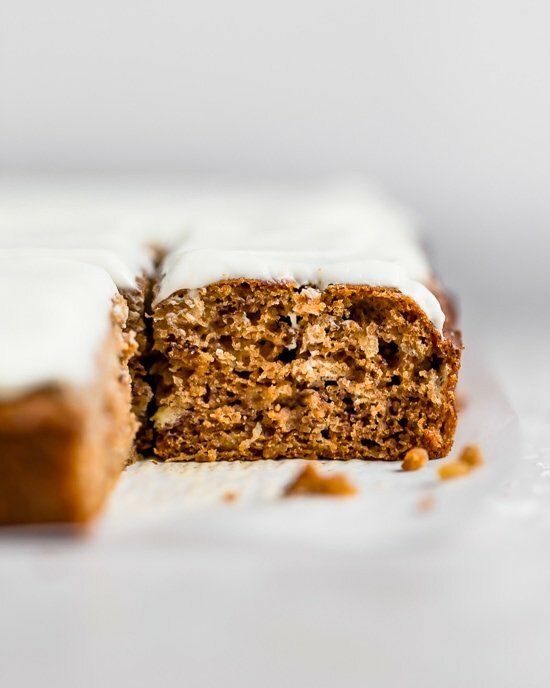 For us it could actually do with less honey (my bananas were extremely ripe/sweet) and while the cream cheese frosting is a favorite of mine, this cake is good enough to go without! Made this last night and it was a hit! I only needed four bananas, and took it out a few minutes early. Everyone loved it, even though it’s so hot here right now that the frosting melted off. ? This was amazing. 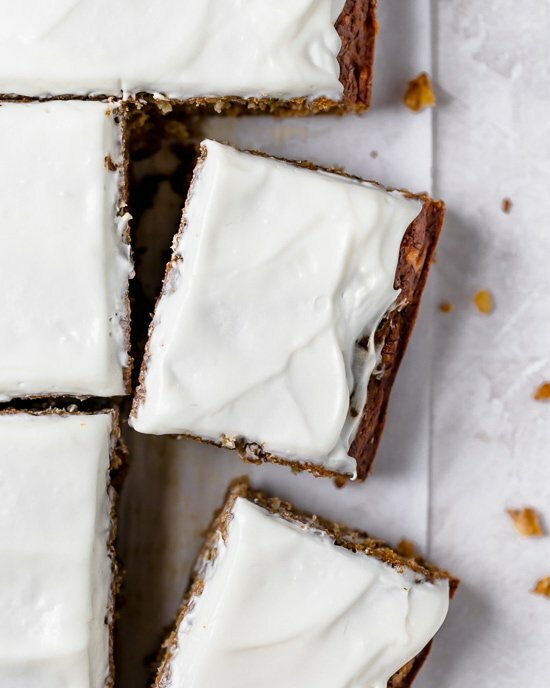 Definitely like a summer version of carrot cake. I made it for my husband’s birthday and we’ve been loving it. Thank you Gina! Did you drain the zucchini well? Correct amount of zucchini? I absolutely love this recipe! Gina what did you use to squeeze a zucchini? I did it by hand and not sure if i squeezed it enough. Made this tonight and it’s wonderful! Turned out just like the photos. So rich and flavorful, and MY KIDS ATE ZUCCHINI!!!! Tried this over the weekend and it was LOVED by all!! I added some candied ginger that I minced up, and it was a moist spice cake. The men never knew about the zucchini and thought it was a decadent cake! Thank you!! I made this tonight and it was so wet that the interior of the cake never baked. It formed a lovely brown crust on the top and bottom. It was in the oven for 50 minutes. But I ended up having to scrape it out of the pan in a mushy lump. I drained the pineapple and squeezed the zucchini out, but it was just too wet. I didn’t make any alterations to the recipe. Any thoughts on what went wrong? Used just 1/3 cup of maple syrup instead of the 2/3 cuos honey and got 22 muffins making them 2 points each! They are plenty sweet enough and lovely and moist! How long did you bake them for as muffins? I am picking zucchini by the bushels with no end in sight. I have shared a lot of zucchini bread with family and friends. 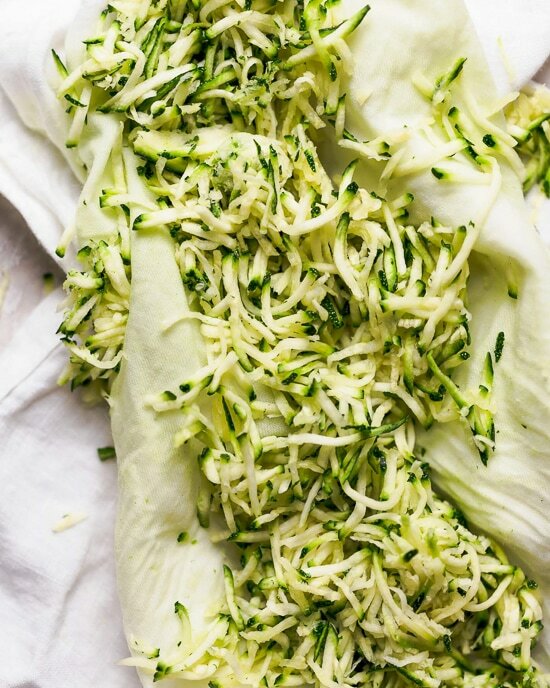 They will be thrilled that I have found a new zucchini recipe. ? Thank you for sharing! What can substitute for pineapple…so allergic to it? Was wondering if you could cook this as a bread instead of a sheet cake. If so, what changes in temperature and cook time would you recommend. Thanks so much! It looks really good! Perhaps more banana? Without testing I don’t want to steer you wrong. FYI, I just used the WW online food list to find the Frosting ingredients: the cream cheese was a total of 24 freestyle points (FSP), and the powdered sugar is 7 FSP for a total of 31, divided by 16 servings = 1.9375 FSP that can be reduced from the per serving points!!!! Yeah!!!! Going to buy some flour and get baking!!! This looks delicious !! How would the nutritional info/WW smart points for Freestyle change is the icing was omitted ??? No one in my family likes icing ..thanks so much ! I’m wondering about making it low carb with a mix of almond and coconut flour…thoughts? Coconut flour will make it too wet. Almond flour is too dense. When I was Paleo, substituting those flours with a regular non paleo recipe never worked out b/c the liquids and oils need to be adjusted too. I’d love to try it with grain free flours. I wonder if half almond/half tapioca starch would work. I have had good luck with that combo replicating regular flour. could this freeze well without the frosting? Or even with? Why is this coded as a gluten free recipe? It calls for all-purpose and whole wheat flour! So does that mean 2 cups of bob mills gluten free flour? Tthe amount of flour actually stays the same for Bob’s GF flour so it would come to 1 1/2 cups. Do you have to use a metal cake pan? I have glass of the same size and really don’t want to buy another pan. I was taught that if you substitute glass for metal, you should reduce the temp by 25 degrees. But I’m not sure if that is a “written-in-stone” rule, or just a guideline?! Anyone know for sure? This sounds delicious! Can you use only white flour and not mix white and wheat? 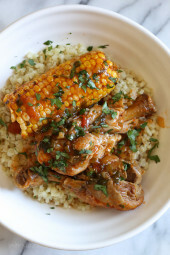 This recipe sounds perfect for our 4th of July celebration gathering! I’m not clear on what size sheet pan..I have a 13″ x 10″. That size or larger? Thanks for your clarification. I would like to know if the zucchini can be replaced with carrot. The recipe says 9x13x2. I think your pan should be fine but maybe bake a few minutes less? I have been looking for a good smash cake recipe for my daughter’s first birthday that is not full of processed stuff and this looks like it will be perfect!! Great! Hope she has a happy birthday! How many zucchini is 8oz about? Would Cup4cup flour work in this recipe? i was wondering if one could substitute Agave for honey, or have you tried using Agave sweetener in any recipes? I always use agave in place of honey and it works great for me! Thinking of making ahead of time without the frostin and freezing it. Then when ready to use, defrost for the day and then apply frosting? What’s everyone think!? Could you use something else in place of honey, like unsweetened applesauce or non fat yogurt? it needs a sweetener. Maple syrup or agave? This looks delicious! Can you substitute sugar for honey? If so, would it be 2/3 cup or less? Thanks! I just googled this and found this: The Rule: For every 1 cup of sugar, substitute 1/2 to 2/3 cup honey. How many points if no frosting? Is it possible to change the bananas by something else ???? Sure but without testing it myself, I can’t guarantee the results. Is there any substitute for the pineapple, this sounds amazing but I’m allergic. I’m in the same boat and also allergic to apples. Was thinking just extra bananas. 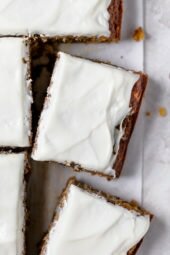 Can you make this with just egg whites? Do you think this would work replacing the zucchini with carrot? The recipe almost looks like a sunshine carrot cake. Just my preference. But do like pineapple.